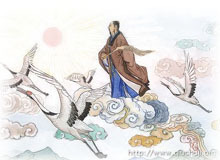 Qiu Chuji, whose original name is unknown, was born on the 19th day of the first lunar month in the 8th year of the Huangtong era of the Jin dynasty (1148) in Bindu Village, Qixia County, Dengzhou Prefecture, Shandong Province. Since childhood he had no interest in Confucianism but was keen on immortality practice. At the age of 19, he renounced the worldly life and was initiated into Daoism. © Copy right qiuchuji.org All rights reserved.